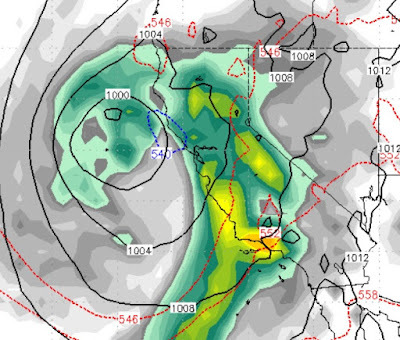 After a near miss on Thursday, a much bigger storm should effect the entire state of California. Right now the models have the Central Sierra taking the biggest blow, but I think we will get our fair share. You can see by the image, with the counter clockwise rotation of the low pressure system, warm, moist air will accompany this storm. I expect snow levels to start fairly high (7,500 - 8,000 feet) on Friday. As the storm moves south, it will then drag down some cooler air by Sunday, so I expect snow levels to drop through the event. The trajectory of the initial storm will be subject to some shadowing, but we still expect the Carson Range to pick up 1-2 feet. Initially, Sierra Cement. By Monday, the powder will be much drier. 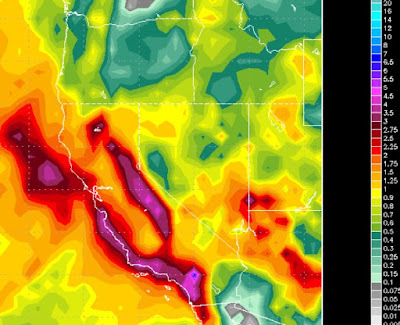 The potential exists for Mammoth to pick up as much as 4-5 feet out this storm. Very beneficial rains will also be delivered to SoCal.